Every student, every day, in every classroom is important! WMS attendance team meets weekly and discusses students individually. Together we come up with great ideas on how we can help each family so our students come to school and enjoy an outstanding day of learning. From customized attendance mailings to home visits, we are here to support families and guardians! Beginning of October and moving forward, we will be offering a new perfect attendance incentive. All students who have perfect attendance for the month prior will earn a bracelet that will allow them enter the cafeteria and immediately get their lunch. For instance, anybody with perfect attendance for October will earn this privilege for November. We are hopeful that this will help with our student attendance improve. Day 1 of absence: If parent/ guardian have not called students out, secretary will call the home to inquire about absence. Day 3 of excuse/unexcused absence: the secretary will mail a letter that explains chronic absenteeism. Day 5 of excused/unexcused absence: a parent meeting will be arranged by a member of the school’s attendance team. At 8 excused/unexcused absences: the school Social Worker and/or Family Liaison will conduct a home visit depending on the individual’s situation and communication from parent/guardian. At 10 days of excused/unexcused absence: a PPT will be conducted. The secretary will generate a letter to families at 4, 6 or 10 days of unexcused absences. After 10 unexcused absences, and a PPT has been held *If appropriate, a DCF referral will be made for Educational Neglect. 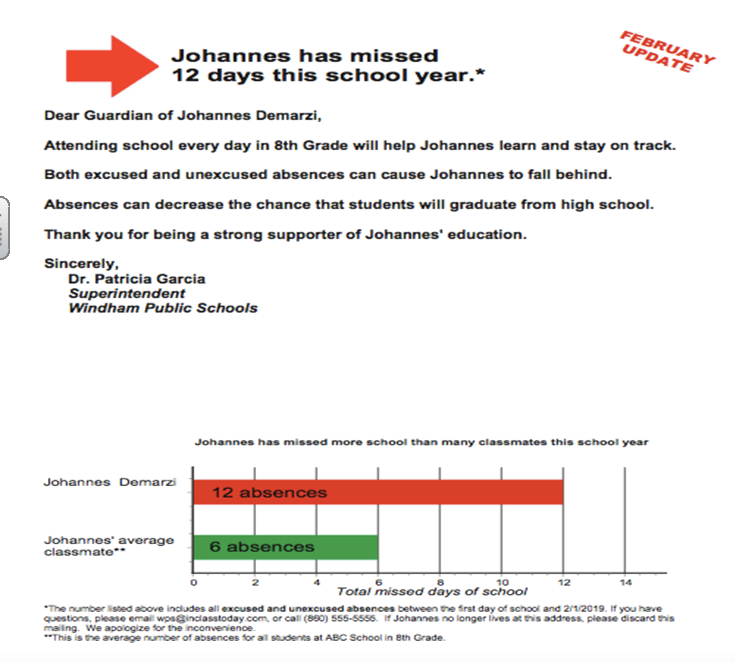 Below is an example of what a mailer looks like that you might receive reporting on your child's attendance.